Posted in Book Reviews, Graphic Novels	by Cait H.
Teen Boat! is the Ignatz Award-winning story of a boy with the power to transform into a small yacht! From breaking out into barnacles to facing pirates and detention, all the challenges of adolescence are here with a nautical twist. 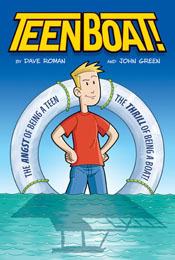 Being a teen AND being a boat means dealing with a lot of pier pressure! Teen Boat! is one interesting graphic novel. Broken into parts, the novel is divided into mini stories – almost like episodes in a television show. All deal with the adventures and antics of Teen Boat, a typical high school guy on the surface, but with the mysterious power to turn into a small yacht. The panels in Teen Boat! are colourful and easy to follow, and the artwork is very easy on the eyes. The story is, like I said, a bunch of mini-episodes all with an overarching plot of Teen Boat in high school and his adventures. There’s a fun mystery with his friend Joey (who climbs through his window via ladder in the first story, very reminiscent of Joey in Dawson’s Creek) who we figure has some sort of changing power, too, only it’s not yet explored. Leaves something for the next book, I suppose! Teen Boat! is a very random graphic novel, with a crazy premise, but good storytelling and artwork. I see elementary school kids getting a kick out of this one, and teens appreciating the humour and situations Teen Boat finds himself in. Hardcover copy received from Thomas Allen & Son in exchange for my honest review. Thank you! It may not be your idea of the best summer before senior year ever, but to Libby Kelting – historical-romance-reading, Jane Austen-adaptation-watching, all-around history nerd – working at Camden Harbor, the Museum of Main and the Sea (“In here, it’s always 1791!”) is, like, a dream come true. Supercute coastal location, a fabulous wardrobe of eighteenth-century fashion, hearth cooking, needlepoint…what’s not to love? Throw in a summer fling with Cam, the hottest sailor in the harbor, and you’ve got yourself an old-fashioned good time. But it’s not all sonnets and primroses. Libby has a majorly annoying roommate situation to deal with, and bunking with rookie newspaper reporter Garrett McCaffrey aboard the Lettie Mae Howell is only a tiny step up. What could be more awkward than sharing a fo’c’sle with a Star Trek-loving geek? Oh, right. Sharing a fo’c’sle with a Star Trek-loving geek and the ghost of a drowned seas captain. It’s not quite the summer she bargained for, but Libby’s going to make it work. Pilgrims Don’t Wear Pink by Stephanie Kate Strohm is so cute and reading it made me wonder why I don’t indulge in more contemporary novels! Libby is off to a summer internship at a historical living museum, where she’ll be immersed in all things eighteenth century. Throw in some cute boys, a mysterious ghost and a hostile roommate, and Libby is in for quite a ride. Libby is a great mix of history buff, fashionista and girl-next-door. She loves shoes and clothes, needs her cell phone, yet knows more history than most high school students would care to even acknowledge exists and has a very down-to-earth personality that allows her to get along with most everybody – except for Ashling, her crazy roommate and Garrett, the geek that just won’t seem to disappear. Dev, Libby’s gay best friend is absolutely hilarious and fashion obsessed. On the lam from a disastrous internship at a magazine, Dev shows up just in time to turn Libby into an eighteenth century beauty before the annual ball at the museum. There was a nice mix of historic facts woven in throughout the story, and they never felt out of place with the plot or dialogue. Libby’s summer romance with Cam made me want to shake her a little bit, since it is very obvious he has an agenda and hidden motives (and not just to the reader – events that happen throughout the book should make it very obvious to Libby, too). I spent half the book wishing she’d just get a clue so the subsequent punch to Cam’s nose after he makes a very inappropriate move is wonderful. Libby can definitely take care of herself, and shows it. The ghost story mystery, while not a huge aspect of the book, is the catalyst for a number of decisions that get made and move the plot along. It’s a cute mystery and feels very Scooby-Doo (in fact, I do believe reference is made to Scooby-Doo throughout the book :D). 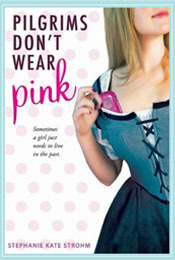 Pilgrims Don’t Wear Pink by Stephanie Kate Strohm is a light, fun and funny read. A nice mix between summer romance, modern-historical and mystery, there is something for most anyone to enjoy. Plot moved along at a nice pace, characters were interesting and engaging and the descriptions of the clothes, museum and events are vivid and detailed. If you want to try out some historical or contemporary without diving all the way in, this is a great book for testing the waters. Paperback copy received from Thomas Allen & Son in exchange for my honest review. Thank you! The prince returns to his castle, intent on making Sunday fall in love with him as the man he is, not the frog he was. But Sunday is not so easy to woo. How can she feel such a strange, strong attraction to this prince she barely knows? And what twisted secrets lie hidden in his past – and hers? 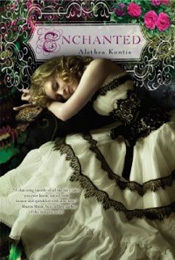 Enchanted by Alethea Kontis is like a love story to fairy tales. The original story, which at it’s heart is a remix of The Princess and the Frog fairy tale, manages to include so many shout-outs to other fairy tales that it’s amazing – Jack and the Beanstalk and Cinderella are very prominent. Sunday is the seventh daughter of a seventh daughter and she’s a bit more magical than she ever guessed. The daughter of a woodcutter, Sunday lives at home with her father, mother, three of her sisters (Wednesday, Friday and Saturday) and two of her brothers (Trix and Peter). Spending a lot of her time in the wood, Sunday meets a talking frog – obviously an enchanted man. After a kiss on the head one evening as Sunday leaves to go home, the spell is broken and Prince Rumbold – the frog – returns home. Determined to convince Sunday to love him as a man, even though her family hates his, he throws three elaborate balls. During the nights of celebration magic and plots are running wild and Sunday is in for more adventure than simply falling in love could provide. At the beginning of the book is the poem that details the personalities of children born on certain days of the week, and each of the Woodcutter girls personify the day of the week they’re named after very well. At first I thought reading about characters named after the days of the week would be slightly confusing (especially because there are so many of them), but Alethea Kontis writes voice very well, and it was easy to keep all the sisters apart. Their emotions, speech and mannerisms are very distinct. Really the main thing regarding the characters I found confusing was their ages. Trix, older than Sunday (whom I’m assuming is in her late teens if not older) often seems to have the maturity of a six-year old. Sunday also says at one point that she never met her oldest brother Jack, so the differences in their ages must be very great, yet the parents do not seem to be old at all. Most of this can be attributed to the faerie elements to the story, I suppose; long lives and youthful appearances. Prince Rumbold’s scenes at the beginning are quite…choppy? Rumbold is recovering from being a frog, but he’s also seeing things, hearing things, his fairy-godmother Sorrow is doing something to his father the king to keep him young, magic is running wild and it’s all very confusing. The scenes are full of abrupt shifts in places and thought processes, and so much alluding to things that had happened before Rumbold was a frog but that he doesn’t remember, that I was just as confused as he is. The good thing is that things get less confusing very quickly, as his memory returns and the story begins to focus on Rumbold and Sunday, and the three balls. There is a lot of hinting at bad things that happened during the year before Rumbold become a frog that never really get answered, which left me very curious and kind of disappointed since I wanted to know the details. A huge plus in Rumbold’s scenes? Erik and Velius, Rumbold’s guard and cousin, have hilarious banter. They are definitely the comic relief! The ending of Enchanted by Alethea Kontis is so great. There’s this huge big scene with magic spells, giants, love, sadness and maybe even a happily ever after. And though I found a few parts confusing, or unclear, as a whole the story is a brilliant remix and retake on traditional fairy tales. Alethea Kontis put her own spin on the classics and created a world where anything can, and will, happen. Magic is a way of life in the Prince Rumbold’s kingdom, and Sunday’s life quickly becomes more exciting than she could have ever imagined. It’s the details in the writing that make this world come alive, and I would be happy to read more fairy tale stories set in the same world. I feel there is much more that can be explored! ARC received from Thomas Allen & Son Ltd. in exchange for my honest review. Thank you! Austin Parker is never going to see his eighteenth birthday. At the rate his Leukemia is progressing the doctors say his chances of surviving are slim to none even with treatment. So he’s decided it’s time to let go. But before he goes, Austin wants to fix things that have broken in his life. So with the help of his best friend and secret crush, Kaylee, Austin embarks on a journey. He travels to the places he’s loved and those he’s never seen. He visits the people he feels aren’t living life, wanting to make them understand what they’re taking for granted. And what starts as a way to say good-bye and mend fences turns into a passage of love, acceptance, and meaning. Ok. So Never Eighteen is the story of one weekend when Austin, with the help of his best friend Kaylee, visits people he feels need a crying shoulder, an apology or just someone to talk to, places he loves and wants to see, experiences a kegger and tries to get over his fear of heights. All as a final farewell before his Leukemia progresses too far. The best part of Never Eighteen, for me, is the way that the story just wakes up with Austin on the weekend and follows his journey. We know from the back of the book what he is doing, and why, but it is not told to us until much later. The book doesn’t start with Austin explaining everything – not even Kaylee knows why she’s driving him around all weekend (though you know she has to be figuring it out), and I love that. The story is a wonderful snapshot into Austin’s life. You journey with him to the people and places he needs to see, and because of the way in which he reveals the purpose of his journey and the extent of his cancer, I was in crazy tears by the end of the book even though I knew what was coming. And that, is a sign of a good book right there. I mean, I’m tearing up again just writing this review! Austin’s and Kaylee’s weekend is an amazing tribute to life and love. The people that Austin speaks with during the weekend all need someone, and Austin has the urge to try and help, to do what he can to reaffirm that life is worth living to the best of their ability. Austin has so much strength in him, and you know what? So does Kaylee. I don’t know that I’d hold up half as well when faced with the idea that my best friend in the world is dieing from cancer. Never Eighteen is not a long book, but it is packed with more emotion than I would have thought possible. The delivery of the plot is wonderful, and I don’t think I’ll be forgetting Austin and Kaylee anytime soon. ARC provided by Thomas Allen & Son Ltd. in exchange for my honest review. Thank you! 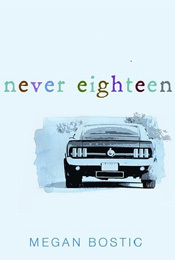 Never Eighteen is part of the 2012 Debut Author Challenge hosted by The Story Siren. Tyger, Tyger is an engaging and promising start to a new series. You’ll be easily swept away with Teagan, her brother Aiden, and Finn on their adventure to Mag Mell and the fight against the goblins and Sídhe. Teagan and her family have always been completely oridinary – until they’re not. With the arrival of “cousin” Finn (in name only), Teagan’s eyes are opened to an entirely new world – one where goblins, Sídhe and Irish legends are all too real. As Teagan, Aiden and Finn race against time to retrieve something precious from the goblins, secrets never even imagined are revealed, and Teagan begins to realize that Finn means more to her than she ever wants to admit. Characterization was wonderful, I was able to really lose myself in Teagan’s voice and family. Teagan is a smart, capable, caring and adventurous girl who, even though her whole life is changing, manages to keep her head in tough situations and look after her family. Aiden, her younger brother, is precocious and creepily smart for his age. Although intelligent, Aiden’s character is kept believably within his age. Finn is the hot, mysterious love interest, and he plays the part well. The romance in the book is kept to a slow, almost non-existant, pace and is background to the adventure. There is enough there to keep the romance readers happy but doesn’t distract from the main storyline at all. The writing really drew me in to Teagan’s world. Kersten Hamilton has managed to put a unique and intriguing spin on Irish mythology and I loved it. I had a hard time keeping it all straight (who was descended from who and what there ancestors had done, exactly) but the lore was rich, and sprinkled throughout the novel so that the reader isn’t bombarded with a ton of knowledge all at once. Everything flowed seamlessly together, with the action scenes paced very well (and they are total attention grabbers). The main plot was wrapped up nicely, but enough questions were left unanswered that the sequel will by much-anticipated. Tyger, Tyger is a heartpounding adventure that will leave you searching for goblins out of the corner of your eye, and anxiously waiting for more. Thank you to Houghton Mifflin Harcourt at NetGalley for providing me the eGalley of Tyger, Tyger for review.